Over the winter months you likely don’t spend a lot of time in the garage. Your main goal is to get from the car into the warmth of the house as quickly as possible, or grab the skis or hockey equipment you need and go. Now the weather has finally warmed up, you might be a little more interested in spending time in the garage doing a little spring cleaning. But more than just a sweep and a mop, you need to switch around the winter stuff to make it easier to access gardening supplies and summer recreation equipment. If your garage is already organized, this becomes a much easier task. This is my situation now, and boy it sure makes a difference to the amount of clutter in our life. I’ve either given away or sold anything that I no longer need and there’s not a lot of new stuff coming in to be stored. I’ve organized my garage into zones for gardening supplies, seasonal decorations, car supplies and my golf clubs. When the season changes I just have to switch the things I’ll need to where I can find them easily. Slatwall with hooks and baskets makes this easy. And anything I won’t need for the next six months I can store away in overhead bins. I then just have to give the flooring a wash with soapy water and a mop and I’m done. This is the most challenging stage for garage organizing. There’s bikes of varying sizes, sports equipment, maybe some boxes of old clothes and toys, as well as gardening tools, car accessories and other treasures you just haven’t been able to part with. It’s time to take stock of what you need and what you can get rid of. 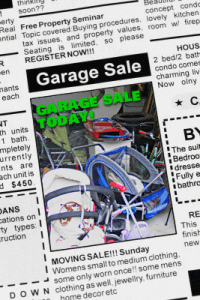 A little cash to be earned from having a garage sale or listing items on Kijiji or Craigslist is a great motivator for kids to help sort through their stuff. Once you’ve gotten rid of what you no longer need, you can organize the rest. Hooks, baskets, overhead containers and bicycle racks make it easy. And before you store away the hockey equipment for the summer, treat it to a professional washing. Most sports stores offer this service, and you can also check out ProCleanGear and Fresh Gear for more information. They don’t call this the sandwich generation for nothing. In the garage, it can feel like your car and your stuff is literally sandwiched between your kids’ and your parents’ stored furniture. Granted, it’s difficult to part with furniture that has sentimental value – but there are solutions. Take an honest look and decide if you’ll really ever use it again. And ask your kids. Most of us gladly furnished our first homes with our parents’ old furniture, but today’s generation seems less willing to. Sell what you can and look for ways to re-purpose the rest. An old wooden coffee table or chair could have new life inside your house with a coat or paint or a faux finish. No matter your age or stage of life, an organized garage can make spring-cleaning a simple task. For more ideas on how to create a garage that fits your life, have a look at my website.